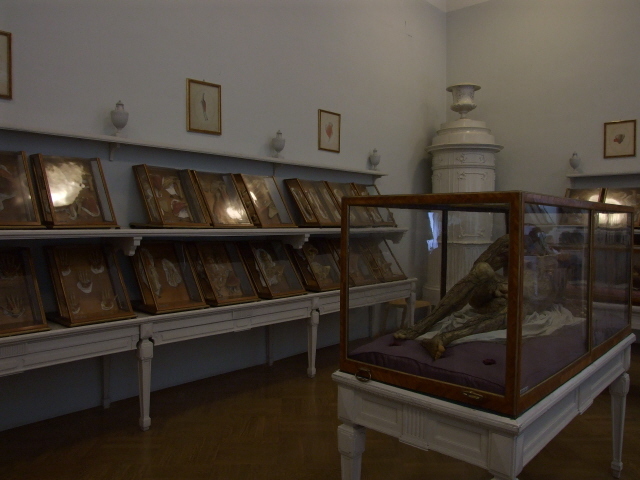 An exhibition about medical history at one the world's foremost locations in that respect (Vienna) – augmented by a vast selection of fascinating and unique wax models for anatomical study, including some really gory ones. 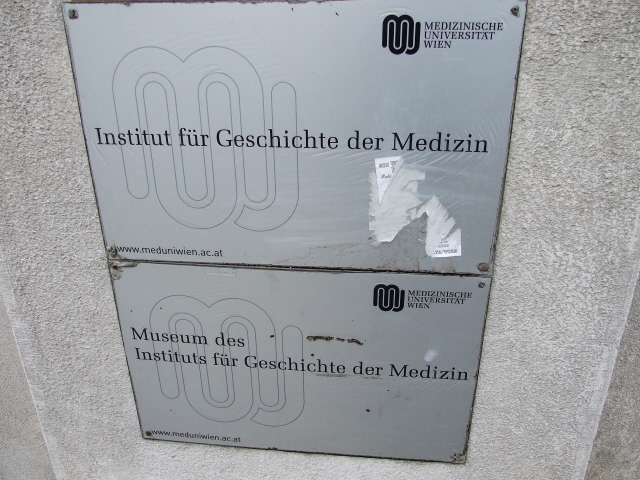 More background info: The medical university in Vienna is one of the oldest and most significant in the whole of medical history. Numerous breakthroughs have been achieved here; e.g. the very first stomach cancer operation (surgical removal of a tumour) by the pioneering surgeon Theodor Billroth. 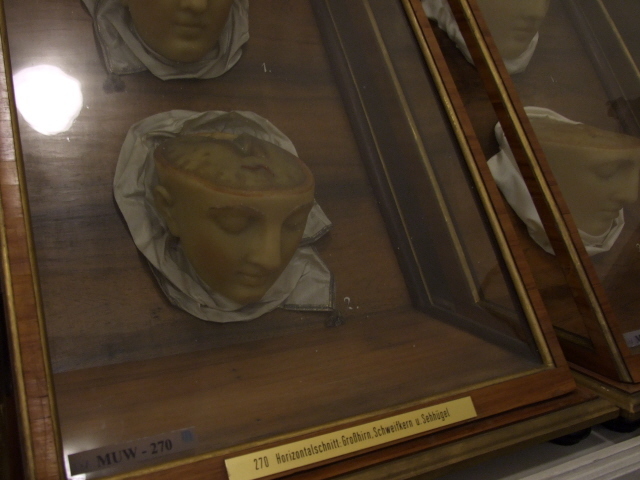 In addition to the theoretical and practical advances of medicine, Vienna's medical department has also long been leading in its collection of specimens and medical study objects. This was given a particular boost under the reign of Emperor Joseph II, a highlight of the period of enlightenment in Austria in many ways, including medical enlightenment, when the emperor personally commissioned a large number of anatomical wax models to be made for the university, apparently he paid for the enormous costs out of his own coffers – the equivalent of several million Euros in today's money. He had seen some anatomical wax models in Florence – and wanted the same, only much better, for Vienna too ... and so it came to be. 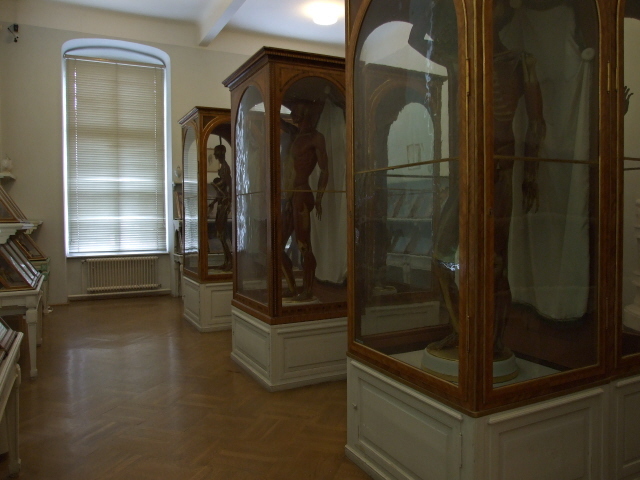 Other cities/universities have such wax model collections as well, but none can compete with Vienna as regards the sheer number of models and the range of anatomical aspects covered – there are nearly 2000 in total, from small details, such as hands, eyes, etc., to several full-body models. The obstetrics section in particular (featuring models of deformed or ill-positioned babies in the womb) is virtually unique in the world. 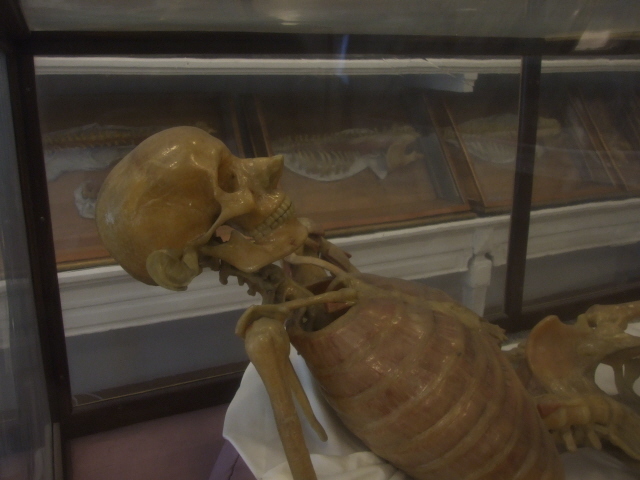 All in all, this super special museum is a must-do not only for those interested in (the history of) medicine in its own right, but also – and especially – for those into the medical branch of dark tourism. 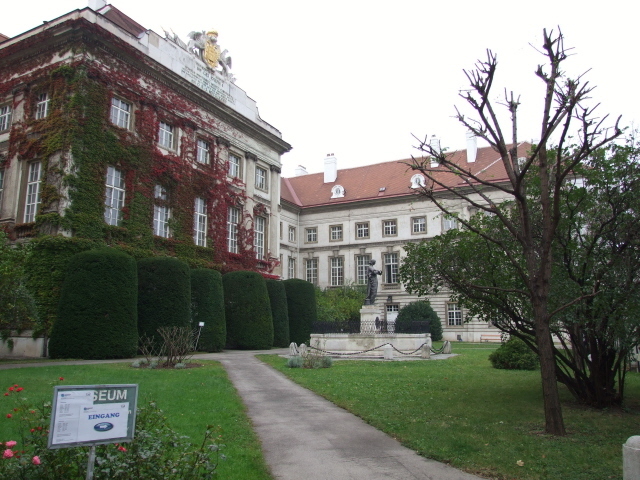 What there is to see: The regular medical exhibition is housed in two upstairs rooms of the Josephinum (other parts still function as a medical institute). 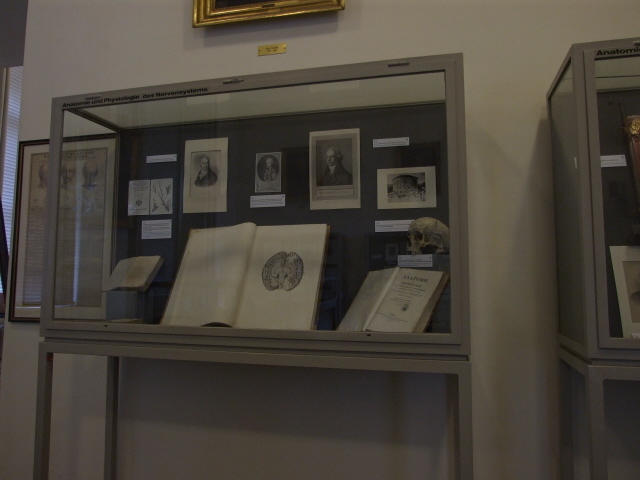 It covers the history of medicine, and the advances made in Vienna in particular, from ca. the mid-17th century up to ca. pre-WWII times, primarily through a range of artefacts and pictures – these include some scarily old-fashioned implements for bloodletting and the like, even a saw for amputations (from pre-anaesthetics times, that is!). Very interesting too is the section on X-rays – the naivety with which the technique was initially applied (before the dangers of radiation were understood) is quite baffling. 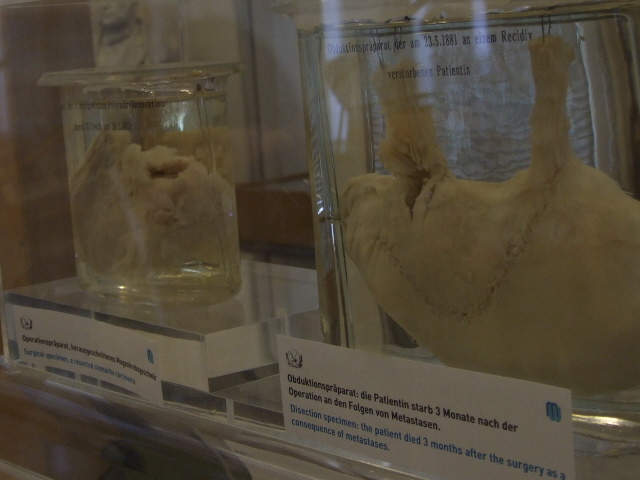 The highlight in this part of the museum is probably the original specimen in a glass jar of the part of the stomach removed in Billroth's famous first surgical cancer operation. Next to the smaller stomach part is a jar with the rest of the same stomach – the woman died three months after the operation, not from the operation itself, it had been quite successful as such, but unfortunately for the patient the cancer continued spreading afterwards and finally got her after all. For this part of the museum you won't necessarily need a guided tour. Most exhibits are labelled in German with an English translation provided (but not always, or not always a full one – but it'll do). The main reason most visitors come here, however, has to be to see those famous wax models. You can view part of the collection as an individual visitor at any point during the opening hours, but I thoroughly recommend the guided tour. For two reasons: you'll need the info, and you are allowed to see models otherwise excluded from public view. For starters, only the guide will bring the models to life, so to speak (if that's allowed in this context). The labelling is minimal, so as a non-specialist in medicine/anatomy you really need to be given extra info to understand why a certain model looks the way it does and what it was for. The large models of full body size are given particular attention, of course, and they deserve it most too. It is remarkable how many of them seem to assume poses of classical Greek statues. In fact that was deliberate, partly to appease the Church, which was rather critical of the whole thing. It's just that these statues lack skin, even muscles and organs – though none is merely a skeleton. The one closest to that is called the "cartilage man" – for indeed he has e.g. ear and nose cartilage, which gives the skull a totally weird appearance, but no flesh on the bones. 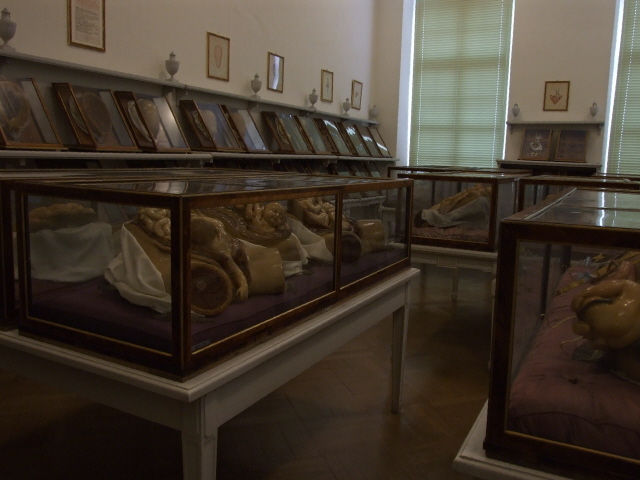 Only on the guided tour, will a separate room be opened for public viewing – namely that with the obstetric wax models. The reason for the restriction is that many of these models are regarded as too sensitive for being displayed without guidance. And indeed, here you not only get plenty of genitalia, some sliced in half, etc., but also models of babies in wombs. A couple of models demonstrate the use of the then "popular" forceps, others show, quite graphically, some "worst-case scenarios", as the guide put it: babies in the wrong position for birth. Even the operation of killing and removing a baby in order to save an otherwise doomed mother's life is represented here. At this point it does indeed get a bit gory. Also in that vein are the models of various deformities of babies, e.g. Siamese twins. In stark contrast, some of the babies' faces are modelled with a good dose of artistic license in a very un-baby-like fashion, with mellow expressions of ca. five-year-olds (just as you often find it in statues or paintings in churches, where baby Jesus often has a face like a mini adult). This obstetric section, by the way, is totally unique – you won't find anything like it anywhere else. But the whole thing is a totally intense experience – the detail of the artistic/scientific execution in these models is really stunning. And it's not all about gore – there's also beauty. Indeed, the "Venuses", i.e. full-body women models, were given decidedly pretty faces. One even wears jewellery ... just above the opened chest. The clear eyes of some of the men too have an almost alive quality, even when the rest of the face (skin) isn't in place ... which can be quite haunting. What a magnificent museum. It's not for everybody, perhaps, but if you have even a mere passing interest in medicine, it's not to be missed. Location: at 25 Währinger Straße, A-1090 Vienna, in the 9th district, Alsergrund, in the university quarter, just a bit west of the Inner City. Access and costs: quite easy to get to; not expensive. Details: To get to the Josephinum you can walk it from the Inner City, from Schottentor on the Ring, by the old university building and the Votiv Church, walk up Währinger Str for about half a mile. Or get any of the trams that depart from the underground circle part of the Schottentor station complex (lines 37 through to 42), – the Josephinum is between the first and second stop. These lines also intersect with the No. 5 tram going past the university complex's north side. Schottentor station is also served by the U2 metro line and the trams that go along this stretch of the ring (1, D). The Josephinum is a three-wing building set back in the centre from the road and fronted by a little pretty park/garden. There's a sign by the gate, and more signs dotted around the garden point the way to the museum: it's on the first floor (= second floor, for Americans) of the north wing to the right. Opening hours: Fridays and Saturdays from 10 a.m. to 6 p.m. as well as Wednesday 4 p.m. to 8 p.m. Regular guided tours (ca. one hour) take place in English on Saturdays at 11 a.m.; tours in German take place on Wednesdays at 6 p.m., Fridays at 11 a.m. and Saturdays at 1 p.m. Admission: 4 EUR (students, seniors: 2 EUR, under 19-year-olds free) – the guided tour costs an additional 3 EUR, which is very reasonable. 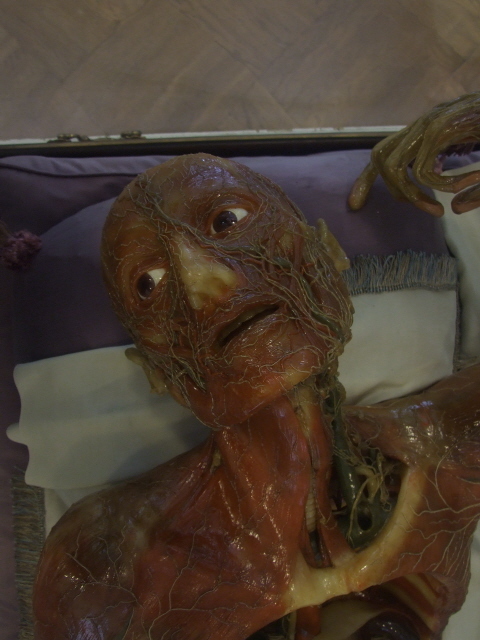 Donations are welcome (and needed for the preservation of the precious wax models). Time required: The guided tour nominally lasts about one hour (when I went it turned out to be a little longer), add to this time you will want to spend on your own in the exhibition going back to individual exhibits and studying bits not covered on the tour. If you don't do the tour and just go and see the exhibition on your own, less than an hour might do. 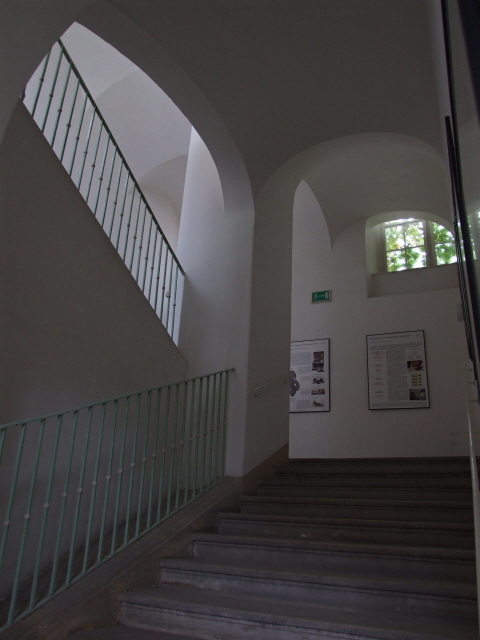 Combinations with other dark destinations: in general see Vienna – the Narrenturm pathological museum does not only fit in with the Josephinum thematically, it's also just round the corner, as it were. The new opening hours of the Josephinum are now also conducive to combining the two sites on the same day, i.e. either Saturday or Wednesday (however: if you need an English-language guided tour only Saturday works, but that would limit your time at the Narrenturm, so it might be better to visit the two places separately on different days after all).